The Norfolk & Western Railway was an eastern mountain railroad with Cincinnati and Columbus the western most outposts. The railroad split at Portsmouth with one line going northwest to Cincinnati and the other north to Columbus. The line from Portsmouth to Columbus was mostly flat following the Scioto River valley. However, the N&W locomotives we saw in Columbus had the heft needed for a mountain railroad. Columbus and the port at Norfolk, VA were the main destinations for the vast quantities of coal mined along the N&W in Virginia and West Virginia. At Columbus the strings of coal cars were received at the N&W’s Watkins and Joyce Avenue Yards and the Pennsylvania Railroad’s Pennor yard. 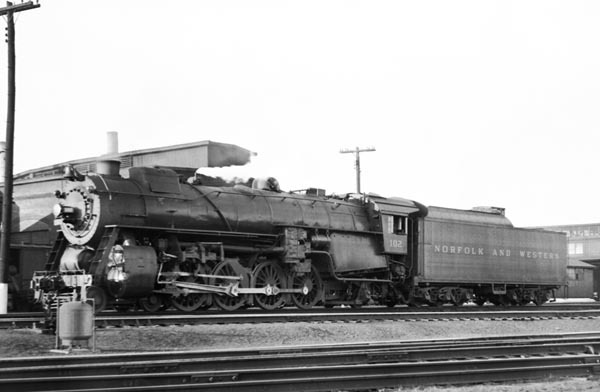 During the 1940s there were two Norfolk-Columbus passenger trains each way, The Pocahontas and The Cavalier. By the 1950s only The Pocahontas remained. The westbound passenger trains were split into two trains at Portsmouth one for Columbus and the other for Cincinnati. In the eastbound direction the two trains were joined at Portsmouth before continuing on to Norfolk. The third significant business, car load and less-than-carload freight, was handled by the two N&W freight houses on Mt. Vernon Avenue. Until the very end of steam the oldest active steamers in Columbus handled the freight house switching chores. 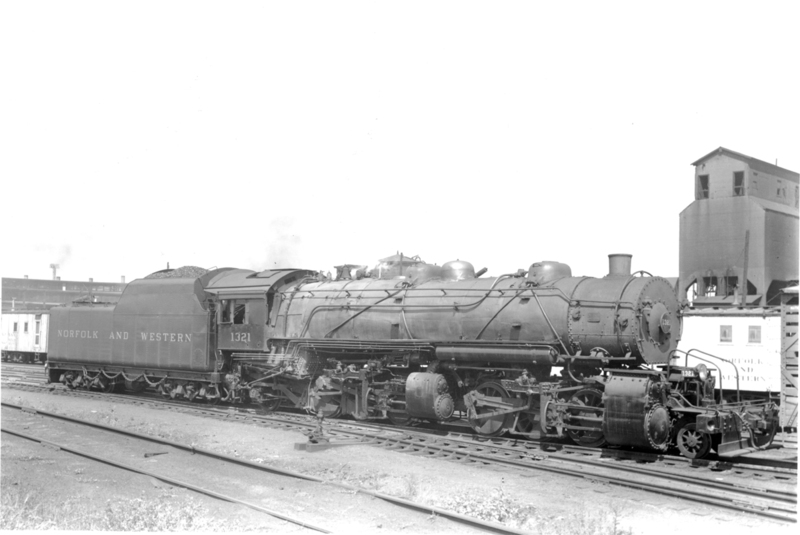 In 1960 the N&W was the last Columbus railroad to give up its steam locomotives. Even to the end N&W employees took great pride in their railroad and steam locomotive fleet. The steamers were well maintained characterized by their clean appearance. The N&W property was also well kept with trash picked up and tools and equipment properly stored when not in use. 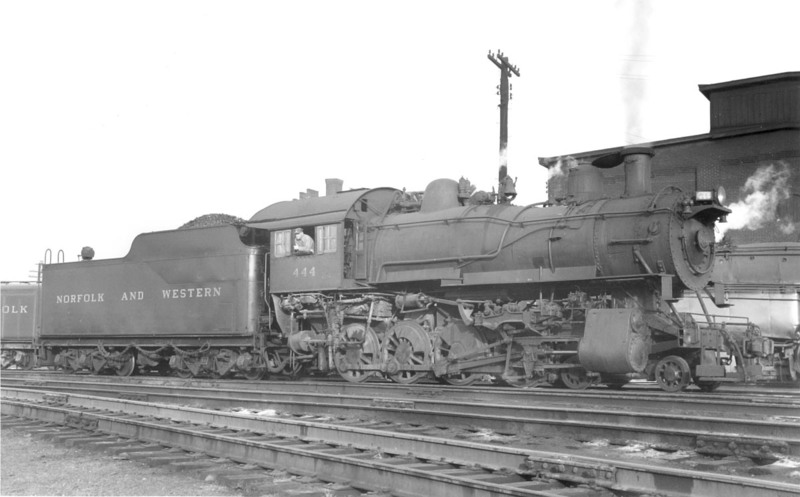 The N&W was a class act right to the end of the steam era. M1 – 4-8-0 – The M1's were built as mainline freight locomotives in 1906-7. By the late 1940s they had long been relegated to switching chores. 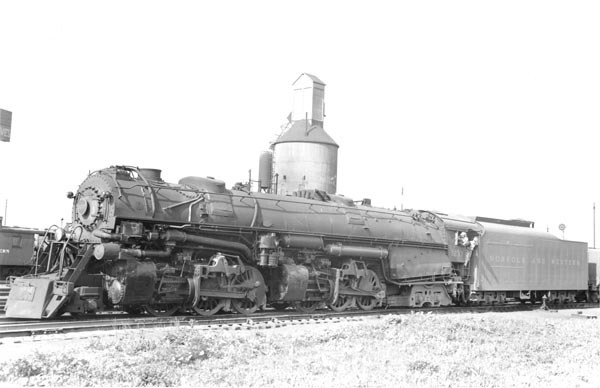 Two M1 locomotives were assigned to Columbus for switching local industries specifically the freight house on Mt. Vernon Avenue. N&W No. 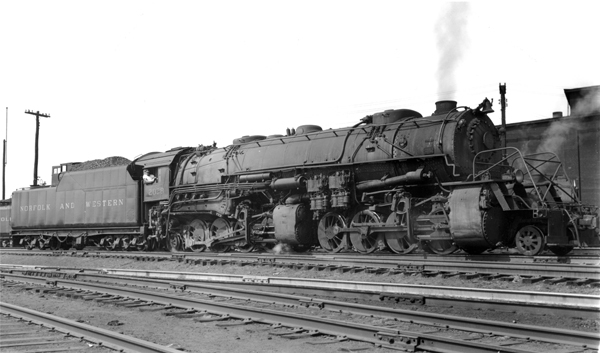 444 at the Joyce Avenue Yard, Columbus, Ohio, October 1953. Photo by Don Etter from the Jay Williams Collection. Additional Class M1 locomotives numbered 1000-1099 were built in 1907. With very few exceptions they were scraped before WW II. S1, S1a – 0-8-0 - Thirty S1 switchers were built for the Chesapeake & Ohio in 1948. The C&O opted for dieselization in the early 1950s selling these almost new 0-8-0 switchers to the N&W. The N&W liked them so well they built 45 in their Roanoke shops during 1951-53. Before the S class the N&W used 4-8-0, class M; 2-8-0, class W2; and 2-6-6-2, class Z1a for switching service. N&W No. 215 at the Joyce Avenue Yard, Columbus, Ohio, September 1952. Photo by Don Etter from the Jay Williams Collection. Engine weight: 247,000 lb Boiler Pressure: 220 lb Builder: Baldwin Loco. K1 – 4-8-2 – Sixteen Mountain class locomotives that were built for passenger service. 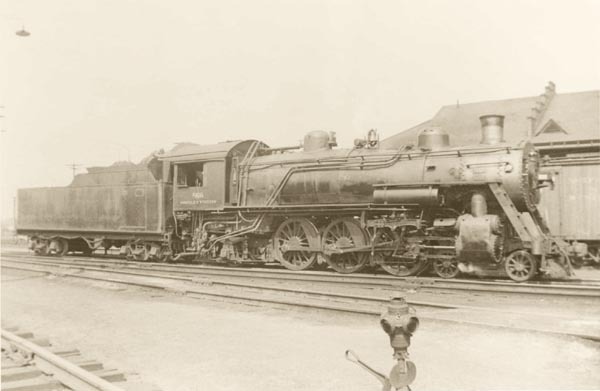 With the introduction of the J Class, 4-8-4, these locomotives were relegated to time freight and on the Columbus-Portsmouth line local switching service. N&W No. 102 at the Joyce Avenue Yard, Columbus, Ohio, June 1955. Photo by Doald A. Kaiser from the Alex Campbell Collection. 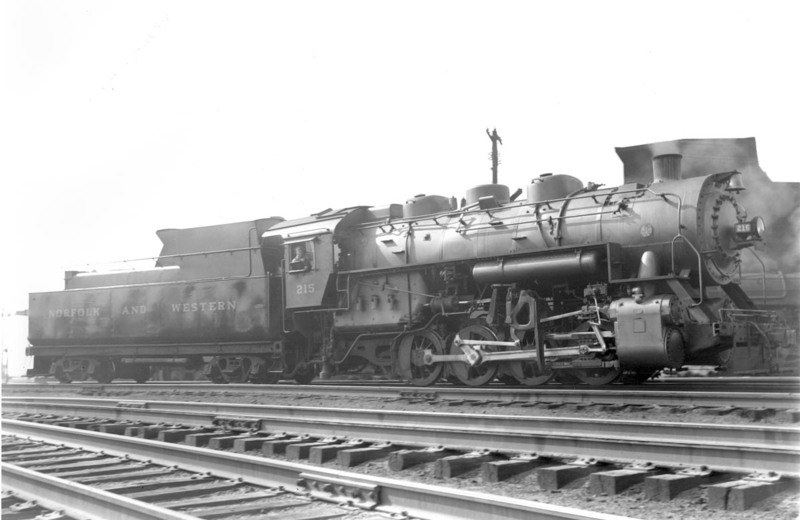 Z1a, Z1b - 2-6-6-2 – There were 190 Z1, Z2a and Z2b locomotives built for the N&W. By 1945 most had been retired with a few Z2b class lasting to the end of steam. The Z2b class was used as road locomotives and along with the Z1a as switching locomotives to make up the long coal trains. There is photographic evidence of Z class locomotives in Columbus in the early 1950s. It is not known how they were used - road or yard service. N&W No. 1321 at the Joyce Avenue Yard, Columbus, Ohio, September 1952. Photo by Don Etter from the Jay Williams Collection. 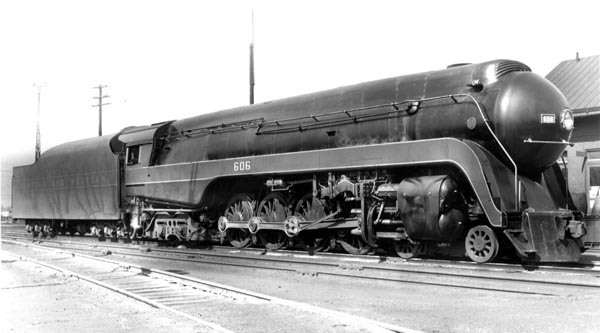 Y3, Y3a - 2-8-8-2 – The USRA standard 2-8-8-2 articulated Mallet compound locomotive. Used on heavy coal drags including on the Columbus-Portsmouth route. N&W No. 2038 at the Joyce Avenue Yard, Columbus, Ohio, ca. 1954. Photo by Don Etter from the Jay Williams Collection. A - 2-6-6-4 – The Class A was originally built for time freight service. The story goes the current power couldn’t do the job. The K1 4-8-2 could obtain the speed, but couldn’t pull the load. The K3 was the opposite it could pull the load but was limited by its design to 35 mph. The Class A was tested at 64 mph with a 7500 ton train on level track. The Class A also worked in passenger service especially during WW II. After the war the Portsmouth-Columbus coal trains were often headed by a Class A. With the addition of auxiliary water tender they were able to complete the 98 miles without a water stop. N&W No. 1237 at the Joyce Avenue Yard, Columbus, Ohio, June 1955. Photo by Don Etter from the Jay Williams Collection. E2a, E2b, - 4-6-2 – The N&W had 62 Pacific Class Locomotives, by 1945 half had been retired, replaced by the 4-8-2, K Class. There are photos showing E Class locomotives in Columbus in the 1940s. No. 578 on display at the Ohio Railway Museum is the last remaining N&W E2a. N&W No. 566 at the Joyce Avenue Yard, Columbus, Ohio, ca. 1945. From the Alex Campbell Collection. Engine weight: 247,000 lb Boiler Pressure: 200 lb Builder: Baldwin Loco. K2, K2a - 4-8-2 – The twenty-two K2 and K2a locomotives were used in passenger and time freight service. After WW II they were streamlined similar to the J Class locomotives. They often apeared in Columbus on the The Pocahontas. N&W No. 136 at the Joyce Avenue Yard, Columbus, Ohio, October 1953. Photo by Don Etter from the Jay Williams Collection. (later 220 lb) Builder: Brooks Loco. 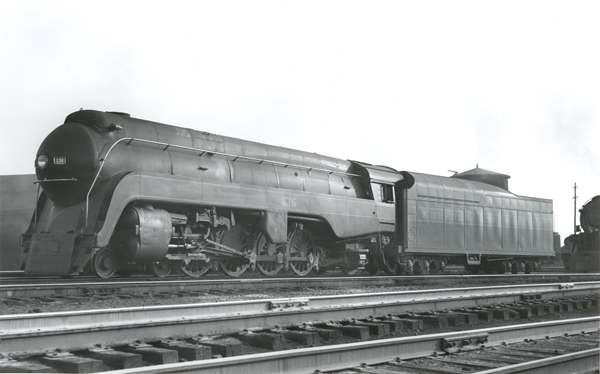 J - 4-8-4 – In 1941 the N&W built their first four J Class locomotives in anticipation of the coming war generated traffic surge they were starting to see. 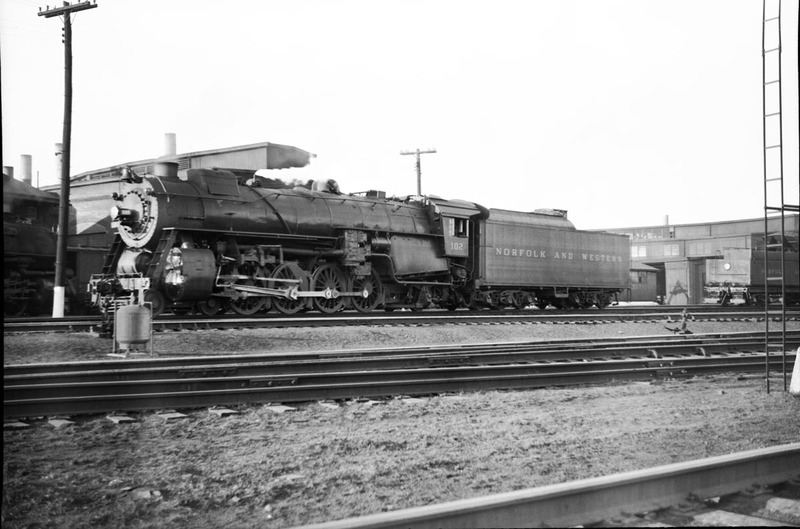 They were fast - 110 mph, they were classy with streamlined locomotive jackets, and they would eventually run from Norfolk – Cincinnati without an engine change. Normally the Columbus trains, which split off at Portsmouth, didn’t warrant a J Class locomotive. Occasionally a J Class did make it to Columbus. N&W No. 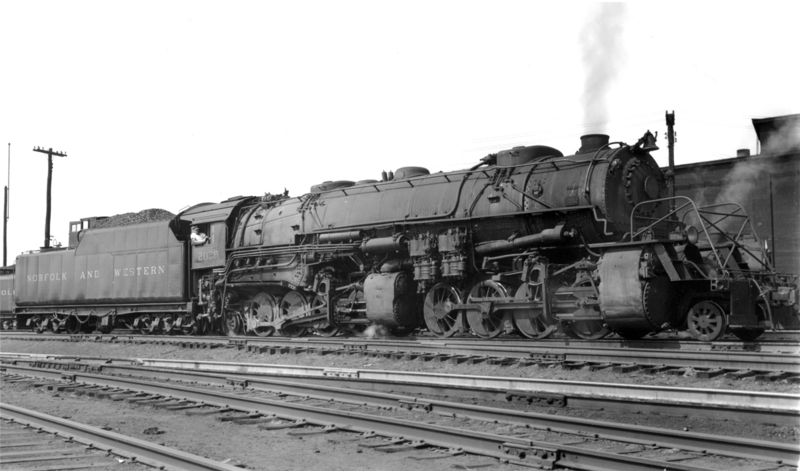 606 at the Joyce Avenue Yard, Columbus, Ohio on April 7, 1946. Photo by R.J. Foster from the Alex Campbell Collection. Published by R.E. Prince, Milard Nebr.